The German engineer's recovery is fizzling. Falling earnings reveal the weak case for combining elevators, car parts and submarines. CEO Heinrich Hiesinger wants to hive off steel but defends his eclectic collection of capital goods. It’s time for more radical ideas. Fourth-quarter profit will be hit by a combination of lower prices for U.S. steel and dearer ones for coal. But the world’s largest steel producer is cutting debt and costs, while its mining unit is on the mend. There’s scope for its dented share price to forge new gains. Despite raising capital three years ago and cutting costs successfully, the German engineering group is making little headway in repairing a flimsy balance sheet. Meeting a key credit covenant is again becoming a stretch, leaving it ill-prepared for potential future headwinds. Investors are confronting the Chinese province of Liaoning over the latest default by Dongbei, a troubled steelmaker. With defaults by state-backed firms escalating, expect more bitter rows like this – especially if debt holders can successfully take on Liaoning in court. Combining Baosteel and Wuhan Steel would create a global giant. If cost and capacity cuts followed, that would underline how serious China is about industrial reform, and suggest a flood of cheap exports could recede. For now, though, it’s easy to be sceptical. Asian companies have typically viewed the United Kingdom as a stable and open market. Now they must grapple with a weak sterling, political chaos, and likely recession. Until they have more clarity on the terms of future trade with the European Union, investment will suffer. By expanding its $5.3 bln Oyu Tolgoi mine in Mongolia, the miner hopes to ride an upswing in demand. Under-investment in new mines and declining quality could see the market in deficit by 2020. But there’s a risk that copper goes the way of iron ore, into a damaging supply war. The giant producer claims cyber thefts breach trade laws and has asked a federal commission to block offending firms’ imports. It’s a novel way to fight a thorny problem but one unlikely to attract imitators. The Middle Kingdom may be too lucrative a market to tempt retaliation. Lenders long assumed the unlisted Indian group would ride to the rescue of subsidiaries. Troubles at its European steel unit, which owes $6 bln, are testing that faith. If Tata forces banks to share its pain, other group companies may have to pay more for their $11 bln of debt. Over two-fifths of the mining group’s investors rejected Mark Cutifani’s pay in a non-binding vote. Anglo should be in investors’ good books: its CEO’s turnaround is working. But by offering a pay package that hedged the risk of it failing, the group shot itself in the foot. Two thirds of the steel giant’s $9.7 bln of net debt is attached to its ailing European business. That is complicating its efforts to extract itself from the disastrous purchase. Even if Tata can offload the assets, it’s hard to see how creditors will avoid sharing the pain. The German engineer may pool its European steel assets with Tata’s Dutch unit. 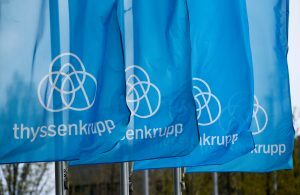 ThyssenKrupp’s share of the synergies could be worth almost 1 bln euros. Halving its conglomerate discount would double the benefits. So far, the market is pricing in only half of the potential. The German engineer and Tata Steel are talking about pooling European steel assets, says a German press report. Closing plants would be politically fraught – look at the row over Tata’s UK operations. But it’s necessary, and Thyssen has shown restructuring mettle before. The Indian steelmaker may sell all of its UK business. Weak local demand and a flood of cheap Chinese imports make Tata’s European arm much less attractive than its domestic operations. M&A at home may also prove more profitable than the ill-fated 2007 takeover of Corus. The Port Talbot plant probably can’t survive in a world flooded with cheap Chinese steel. Yet it has hung on stubbornly long. Across markets like iron, oil and steel, the idea that price wars drive high-cost suppliers to the wall is proving more complicated than once thought. Outgoing chief Sam Walsh cut costs and investment to leave the miner admirably lean. But he also boosted production, pushing down iron prices in the belief that rivals would go to the wall. They didn’t. His successor has a chance to copy the first strategy and ditch the second. After a $7.9 bln net loss for 2015 and big writedowns, the steelmaker has launched a $3 bln rights issue. It buys time for a cost-cutting programme, but ArcelorMittal’s real issue is outside its control: the aggressive supply tactics of Chinese steelmakers and Australian miners. Low-cost iron ore miners BHP Billiton and Rio Tinto are accomplished experts digging for the ferro-raw material. They are much less good at consumption estimates. With the ore at 10-year lows, the companies’ investment cases depend on them getting ahead of China’s demand curve. The South African platinum miner wants to raise $407 mln to fund restructuring. The 46-for-one rights issue means investors that fail to subscribe will be diluted almost out of sight. Much of the investment decision rests on demand for catalytic converters as VW cleans itself up. The Indian steelmaker has written off another $1.3 billion at its ailing European division. Under pressure from cheap Chinese imports, the unit’s EBITDA has turned negative. Tata will need to make tough choices about the business it bought in 2007 sooner rather than later.